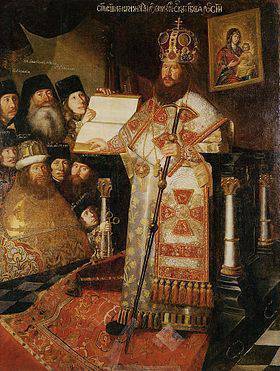 The aim of the ambitious project of Patriarch Nikon of Moscow (1605-1681) was to create the exact replica of the revered places of the Holy Land. 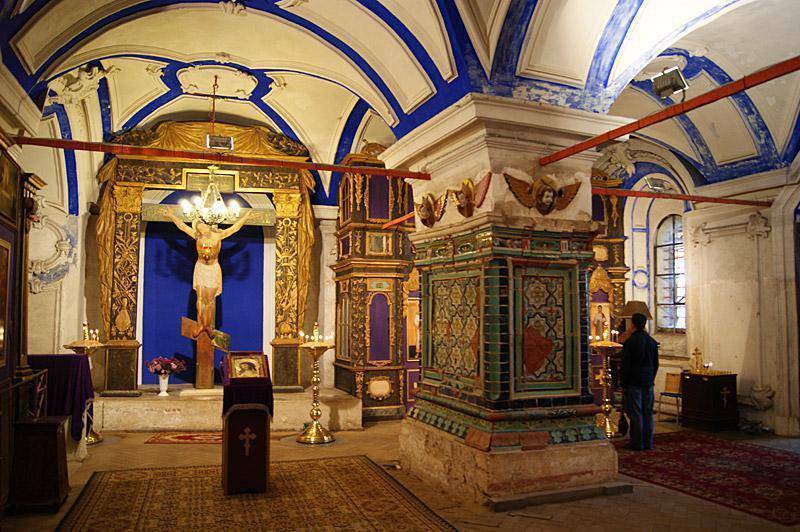 The layout of the monastery is reminiscent of Jerusalem’s Church of the Holy Sepulcher. 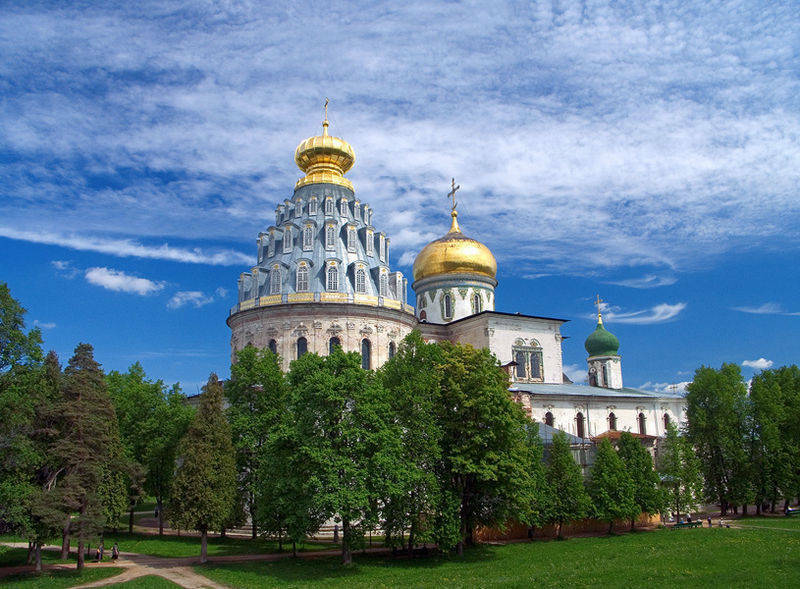 The Monastery is an impressive architectural landmark, built and restored in the 17th and 18th centuries by renowned Russian architects, including Bartolomeo Rastrelli. 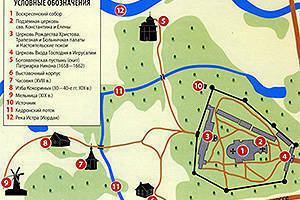 Visitor information is available in Russian only. 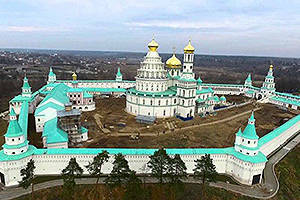 The Stauropegic Resurrection New Jerusalem Monastery Russian: Stavropigialny Viskresensky Novo-Ierusalimsky monastyr or Ставропигиальный Воскресенский Ново-Иерусалимский мужской монастырьis one of the most famous monasteries in the Moscow RegionRussian: Moskovskaya oblast or Московская область. It is a unique and sacred place, marvellous in its design, having been crafted by architects from several epochs. 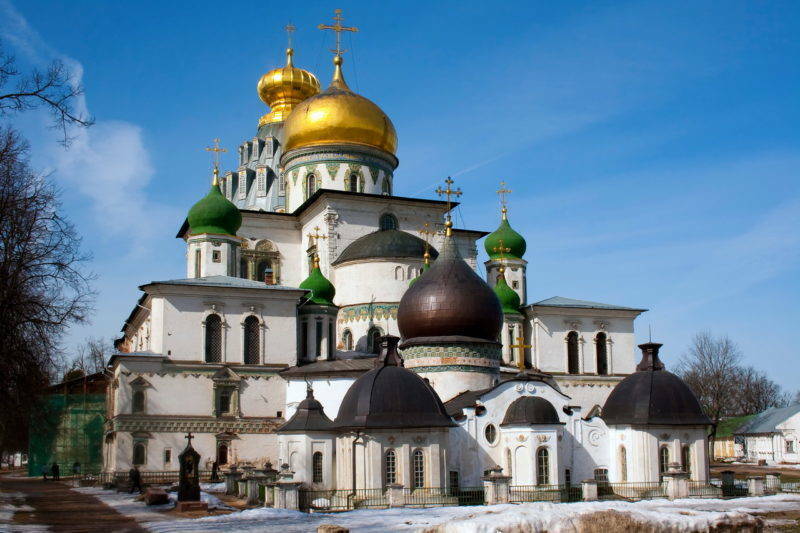 It reproduces the layout of key religious sites in Jerusalem – the Resurrection CathedralRussian: Voskresenskiy khram or Воскресенский храм is the counterpart of the Church of the Holy Sepulchre with its side chapels and the underground Sts Constantine and Helena ChurchRussian: tserkov Konstantina i Eleny or церковь Константина и Елены is the counterpart of the cavernous Palestinian church. 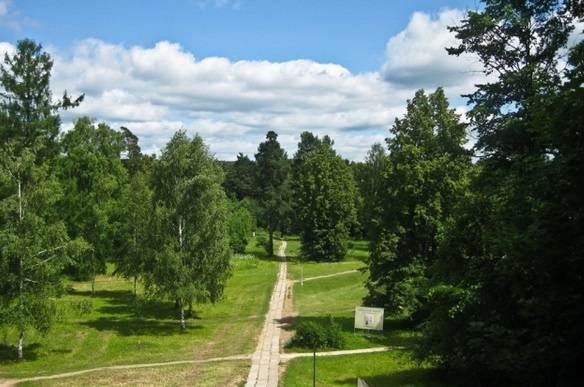 The natural landscape around the monastery bears Biblical names: Mounts (or, rather, hills) Tabor, HermonRussian: Yermon or Ермон, SinaiRussian: Синай, Mount of Olives, the Jordan river (IstraRussian: Истра), and the Garden of Gethsemane. 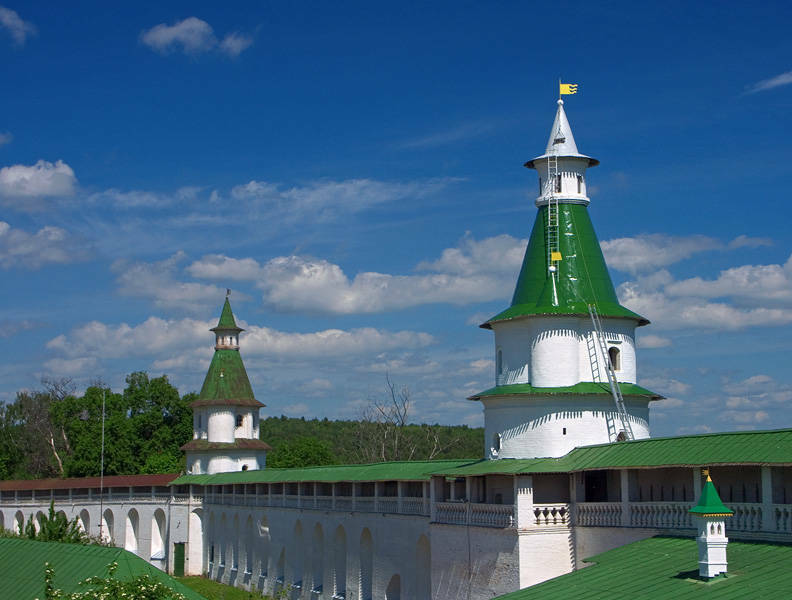 The monastery was founded in the 17th century by Patriarch Nikon. 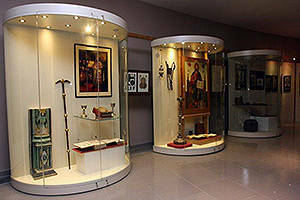 Some of the relics preserved here are connected with his name, including a reliquary and a skete. 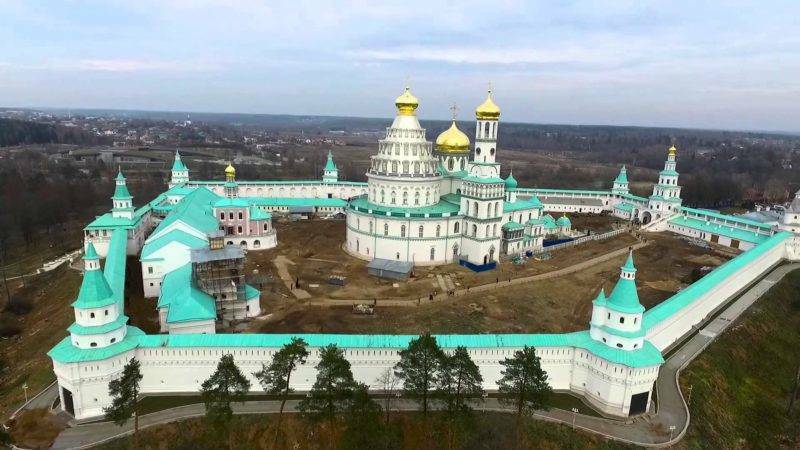 The New Jerusalem Monastery is an active monastery, with tours and a Sunday school for children and adults, as well as an inn for pilgrims. 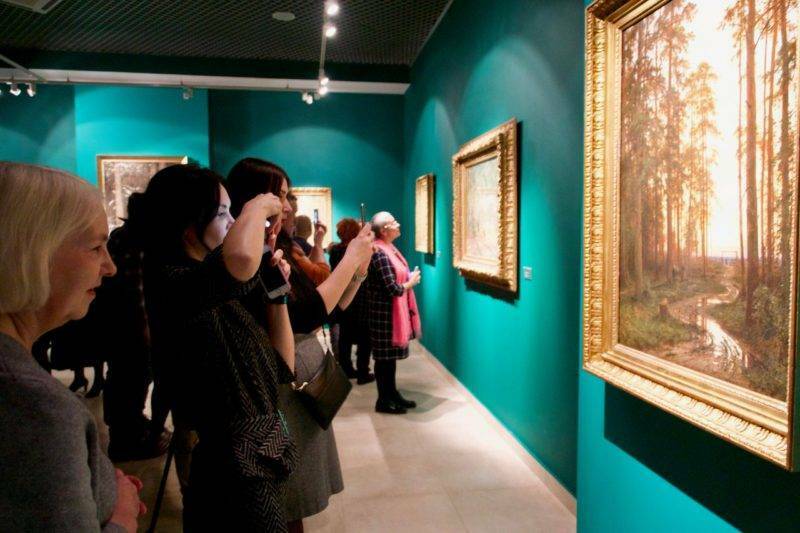 The monastery incorporates a small museum and exhibition centre, where the main display is devoted to Russian ecclesiastical art as well as the archeology and history of the Moscow region. 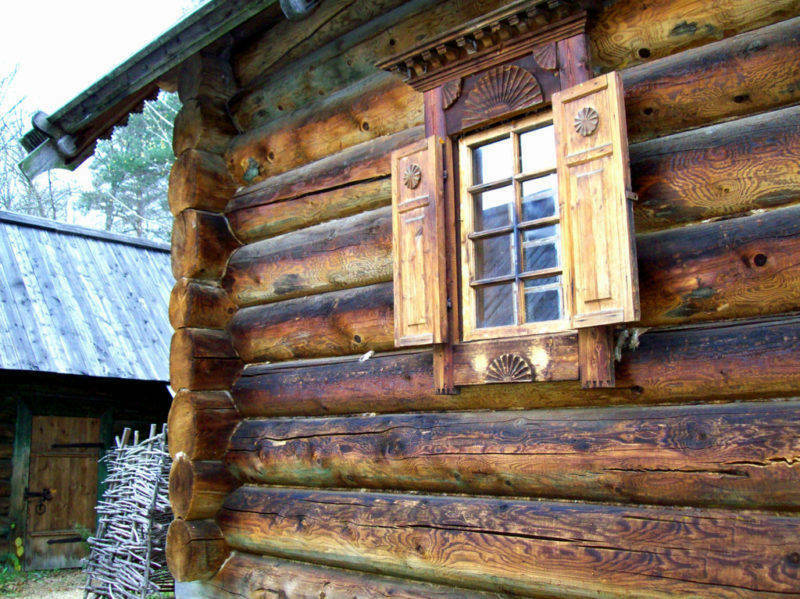 The New Jerusalem Monastery park houses the open-air Museum of Wooden ArchitectureRussian: Muzey derevyannogo zodchestva or Музей деревянного зодчества. The Monastery founder, Patriarch Nikon (1605-1681) left a controversial mark in history. 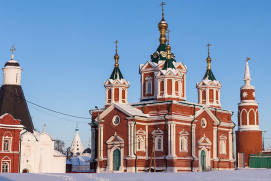 Not everyone in the Orthodox society accepted his reformation of the church, which began in 1653 and brough the Russian Orthodox Church closer to the European Constantinopolitan one. The Old Believerscalled staroobryadtsy in Russian regarded this move as derogatory towards the traditional Russian Church. Resistance to Nikon’s reforms led to tragedy; not only were the Old Believers were not listened to, but they were also subjected to massive persecution and execution. 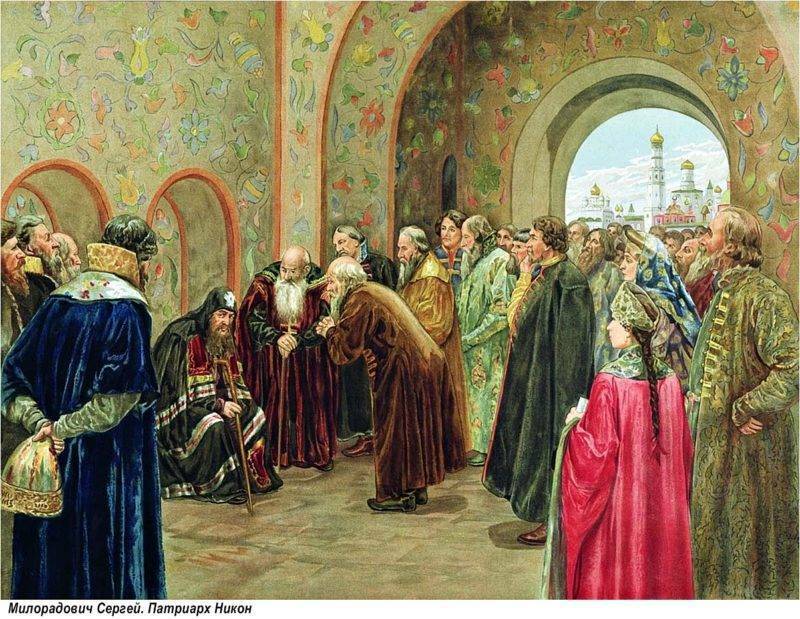 Tsar Alexey Mikhailovichthe tsar of Russia from 1645 until his death in 1676 actively supported Nikon at first. However, after the Russian-Polish and Russian-Swedish wars, when the Patriarch dealt with the internal affairs in a peculiar way on behalf of the sovereign, who was actively involved in the military campaign, Nikon was forced to abdicate the Patriarch’s throne. 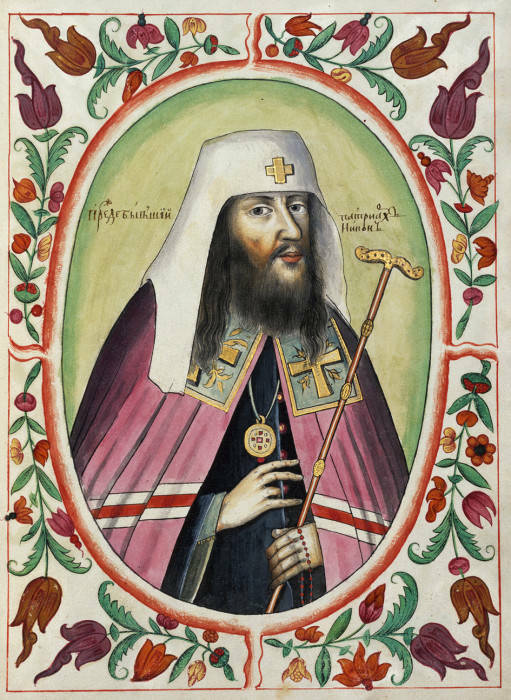 He found himself in disfavor and was exiled to the Therapont MonasteryRussian: Ferapontov monastyr or Ферапонтов монастырь, where he spent 15 years. 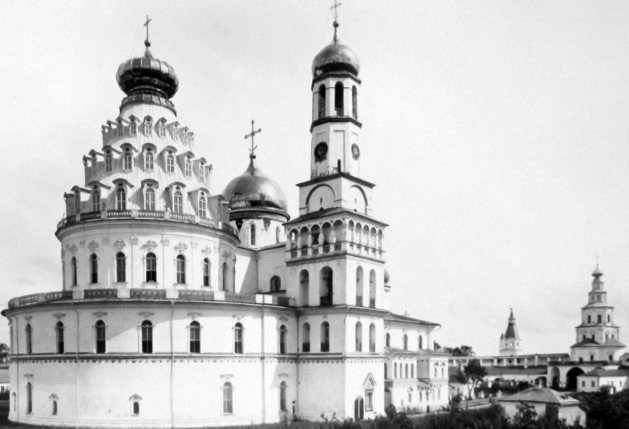 After Tsar Alexey Mikhailovich’s death, the new Tsar – Fyodor Alekseevich – granted Nikon permission to return to his beloved New Jerusalem Monastery. On his way back, Nikon perished and was buried in accordance with the Patriarch’s funeral rites in this monastery under the Cavalry Cross. It was Patriarch Nikon who chose the location for the Monastery. 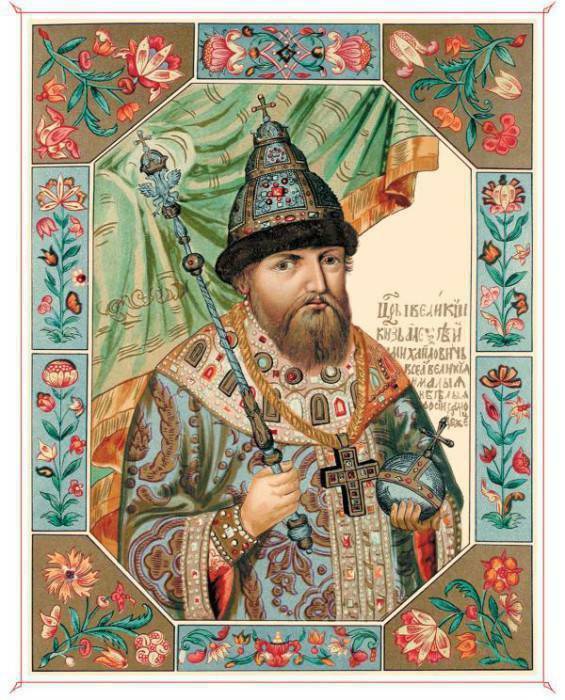 He often travelled to another major monastery, the Iver MonasteryRussian: Iverskiy monastyr or Иверский монастырь in Valdaia town and the administrative center of Valdaysky District in Novgorod Oblast, Russia, stopping along the way in the village of VoskresenskoeRussian: Воскресенское (the contemporary town of IstraRussian: Истра). He found the landscape inspiring, and thus formulated a plan to build a monastery here. 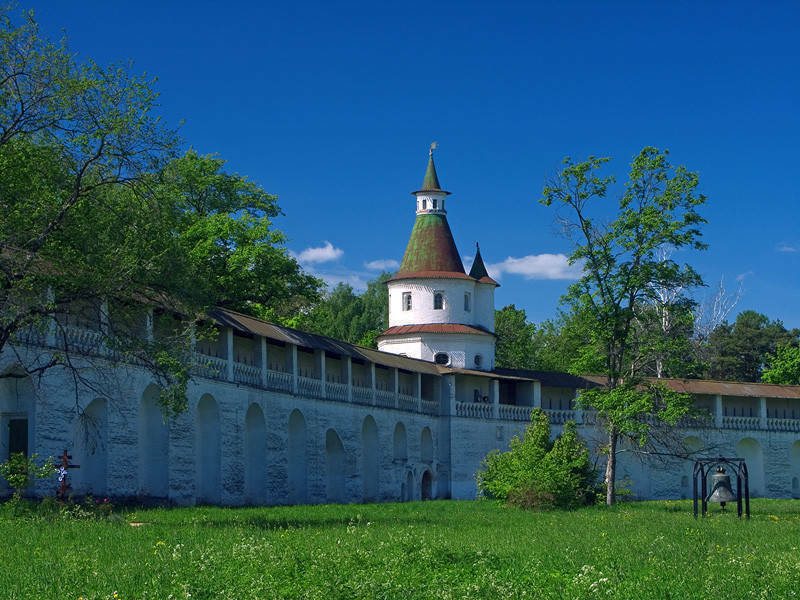 The cloister outside Istra was meant to become a symbol of the Third Rome – Russia’s military and political influence was growing both in the west and the east, and Moscow emerged as a policy-maker in the Orthodox world. In 1656, Nikon began to buy up land plots in the locality, renaming the landscape to fit with his plan. A year later, the wooden Resurrection ChurchRussian: Voznesenskaya tserkov or Вознесенская церковь was built on the Mount of Olives (EleonRussian: Елеон). 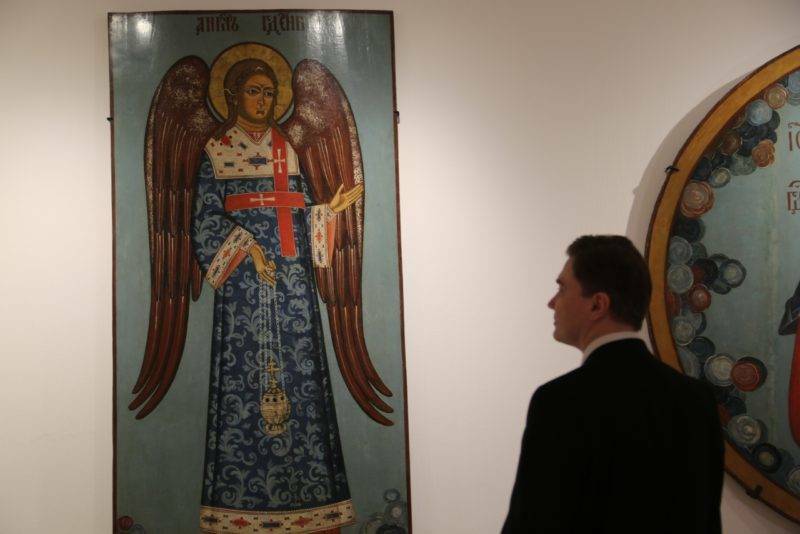 To commemorate its consecration, the Patriarch, together with Tsar Alexis (Alexey Mikhailovich), set up a memorial crossRussian: Poklonnyi krest or Поклонный крест (which was restored in 2006). 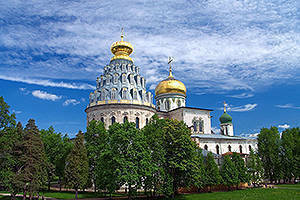 The monastery was established to the west of the Mount of Olives, on a hill renamed ZionRussian: Sion or Сион. To the north is a hill named TaborRussian: Favorskiy or Фаворский. The River Istra was renamed the JordanRussian: Iordan or Иордан. 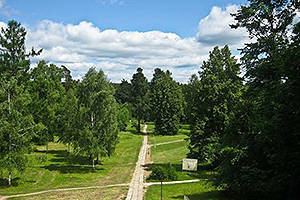 At the entrance to the city there was a small convent, which was given the name of BethanyRussian: Vifaniya or Вифания. 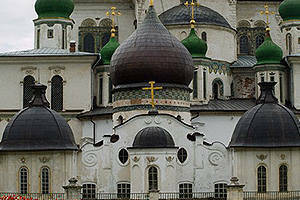 Thus, the topography of The Holy Land was reproduced with accuracy and the New Jerusalem Monastery was created. 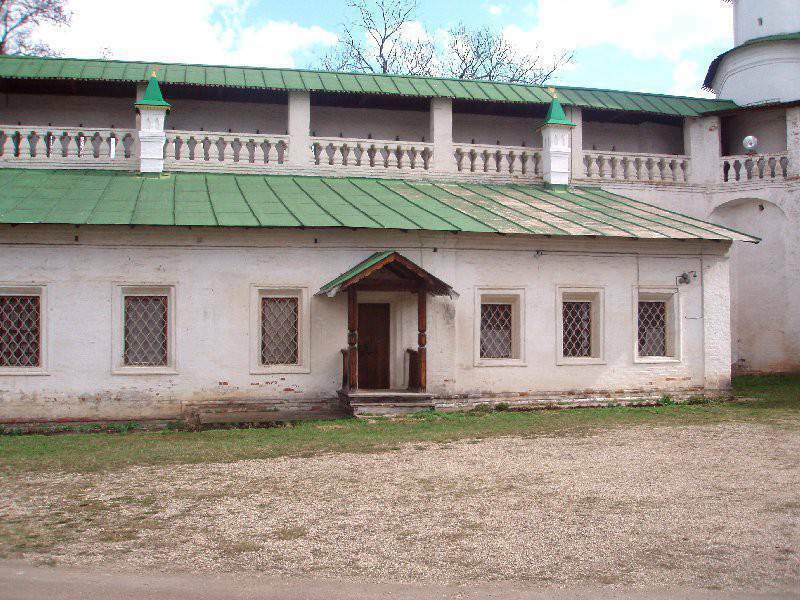 Patriarch Nikon was not able to complete the construction of the monastery before his exile. 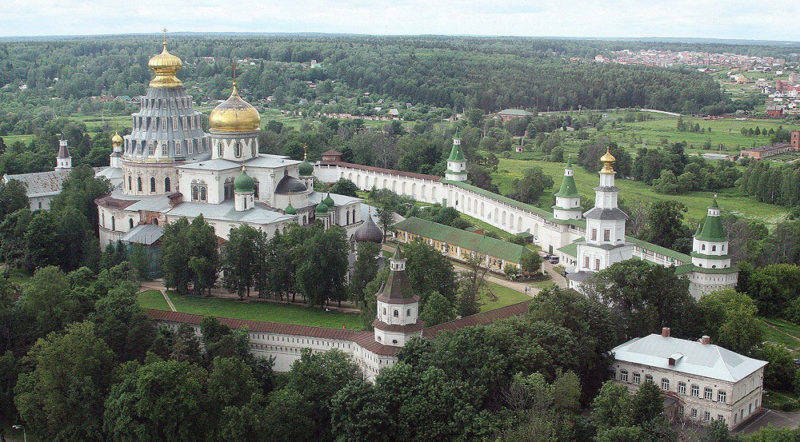 In 1685, under the regency of Tsarevna Sophia, sister of the future Emperor Peter the Greatruled from 1682 until 1725, significant improvements were made in the monastery. 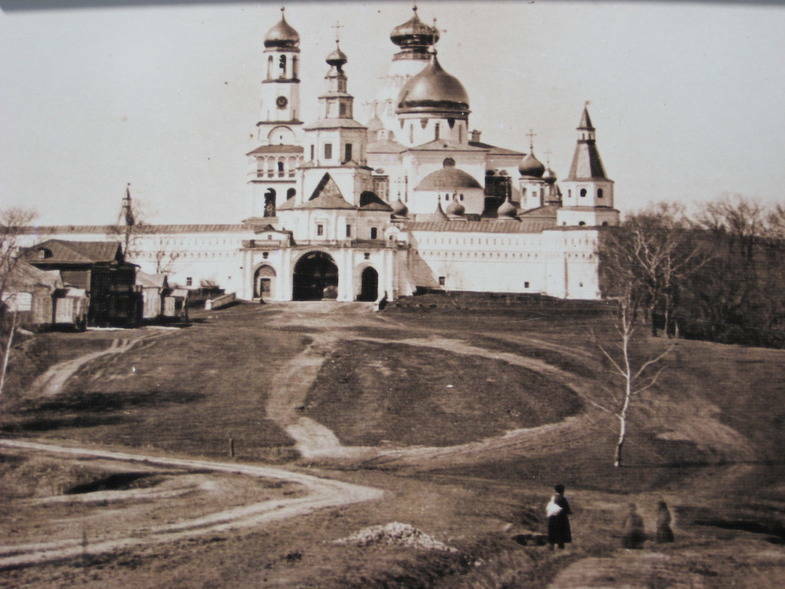 Peter the Great, on the contrary, did not favour monasteries, which led to a sharp decline in the number of monks and thus the monastery’s revenues during his reign; in addition, the monastery was completely burnt down in 1726. It was only 20 years later that Empress Elizabeththe Empress of Russia from 1741 until 1761 (Elizabeth of Russia) undertook to restore the monastery and appointed Karl Blank and Bartolomeo Francesco (Varfolomey) Rastrelli as project architects. This sight is located far away from the city center, and it is comfortable to use a taxi to reach it. 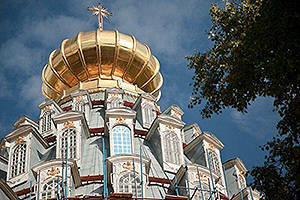 If you are interested in Moscow taxi service, you can read about it on our website page “Taxi in Moscow”. The shape of the Resurrection Cathedral, the church in the monastery, is deemed to have been inspired not only by the Church of the Holy Sepulchre but, presumably, also by the descriptions of Solomon’s Temple drawn from the Bible and the Hagia Sophia of Constantinople. 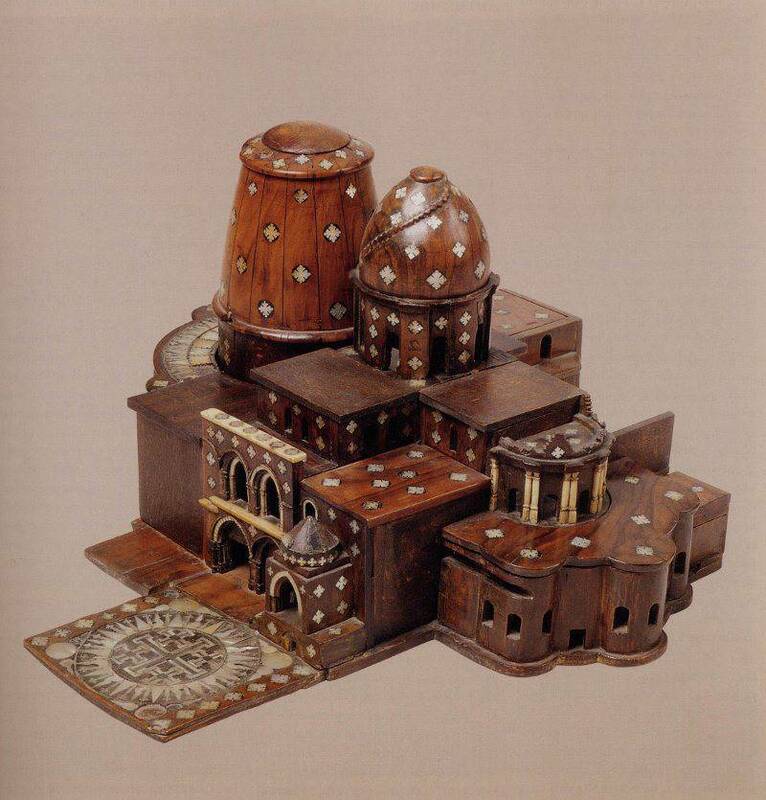 A wooden model of the Holy Sepulchre Church specially brought from Palestine gave the architects an idea of the prototype they were aiming for. 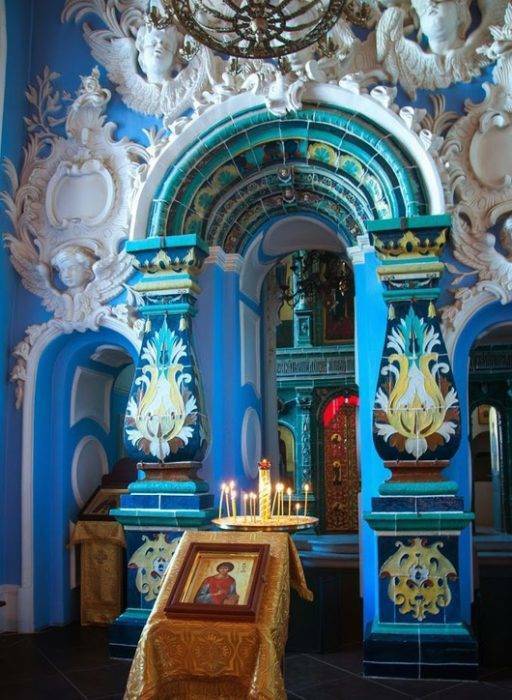 The chief architect was Averky Mokeev, who also participated in the construction of two other monasteries under Patriarch Nikon’s supervision, the Cross MonasteryRussian: Krestnyi monastyr or Крестный монастырь on Kiy Islandan island in the Onega Bay of the White Sea and the Iver Monastery in Valdai. 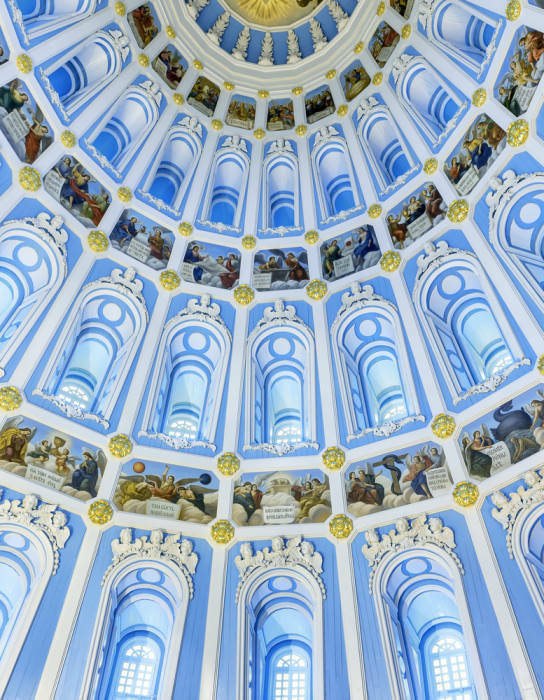 The Resurrection Cathedral of the New Jerusalem Monastery is composed of three parts – an enormous rotunda with a tented roof, a four-columned church and the underground Church of St. Constantine and St. Helena. In addition, the side-chapel of the Beheading of St. John the BaptistRussian: pridel Useknoveniya glavy Ioanna Predtechi or придел Усекновения главы Иоанна Предтечи, the side-chapel of the Dormition of the Mother of GodRussian: pridel Uspeniya Bogomateri or придел Успения Богоматери, and the upper Calvary side-churchRussian: verkhnyaya Golgofskaya pridelnaya tserkov or верхняя Голгофская придельная церковь were built as part of the cathedral. In subsequent restorations, the number of side-chapels grew. The most spectacular element in the overall silhouette of the cathedral is the enormous tented roof which crowns the rotunda. 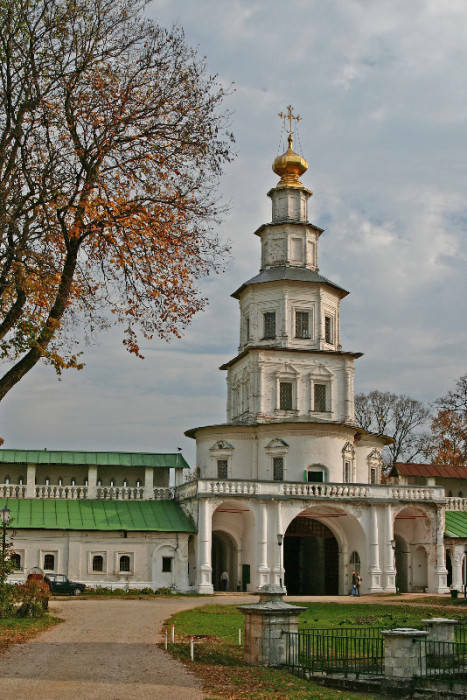 The rotunda houses the Aedicule, or the Chapel of the Holy SepulchreRussian: chasovnya Groba Gospodnya or часовня Гроба Господня. Many people are surprised by the rotunda’s tented roof, as Patriarch Nikon later banned the construction of tent-like roofs in churches. 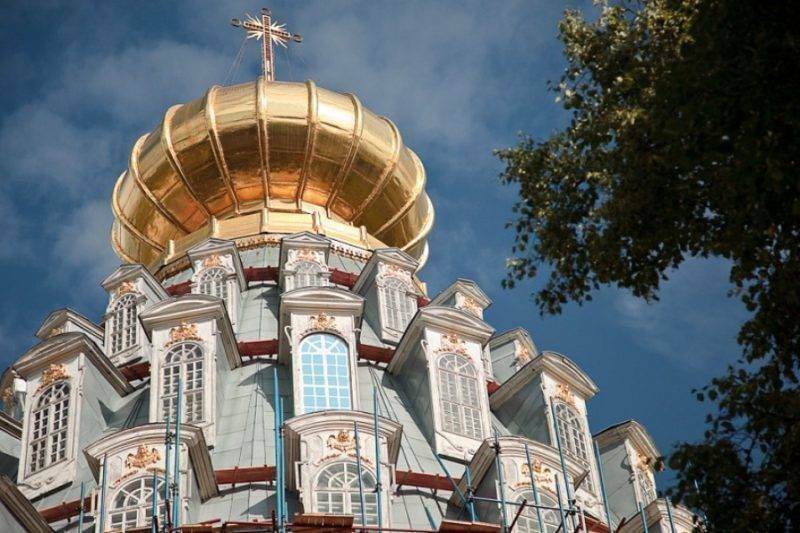 Evidently, this is due to the fact that the Patriarch did not want the cathedral design to be copied because that would undermine the spiritual and religious significance of the Resurrection Cathedral – there could only be one analogue of the Holy Sepulchre in Russia. 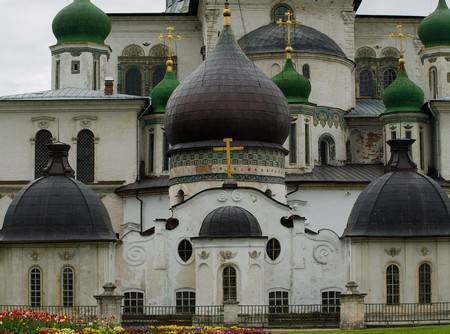 Although the cathedral was built in medieval Russia, it evokes the canonical architectural forms which Russian masters learned from books and prints brought from Western Europe. 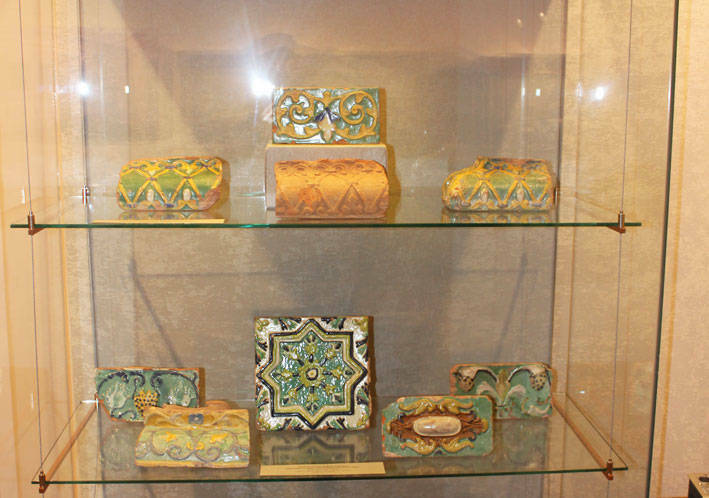 A remarkable sample of traditional Russian art is the ceramic tiles. 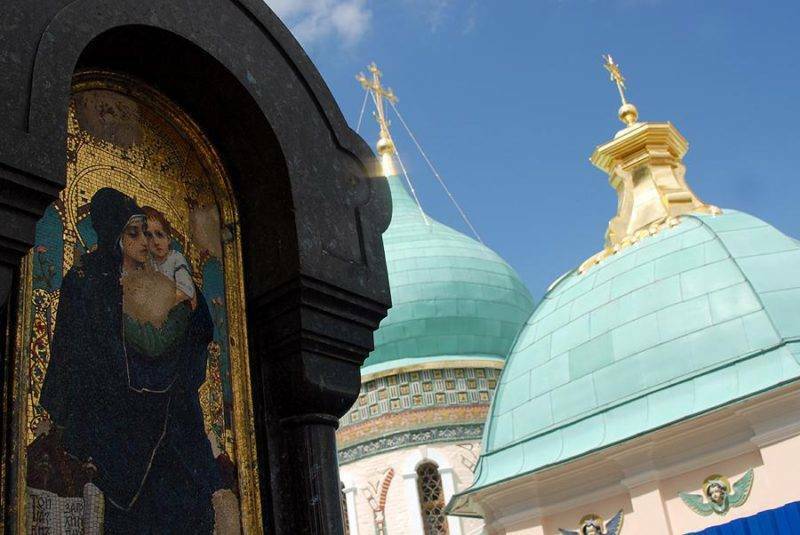 One of the masters working on them was Stepan Polubes, who also decorated Moscow churches with tiles. 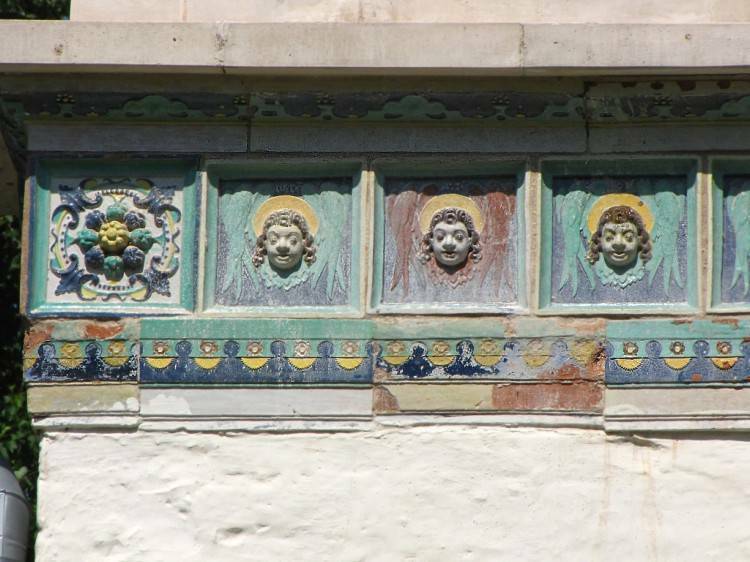 Under Nikon’s supervision, tiles were used even to decorate the iconostases. 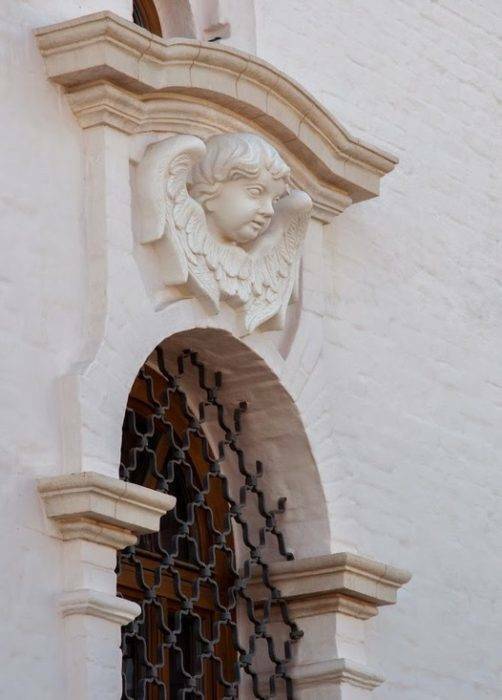 During the reign of Empress Elizabeth, the monastery’s predominate style changed to the Baroque style when it was renovated. 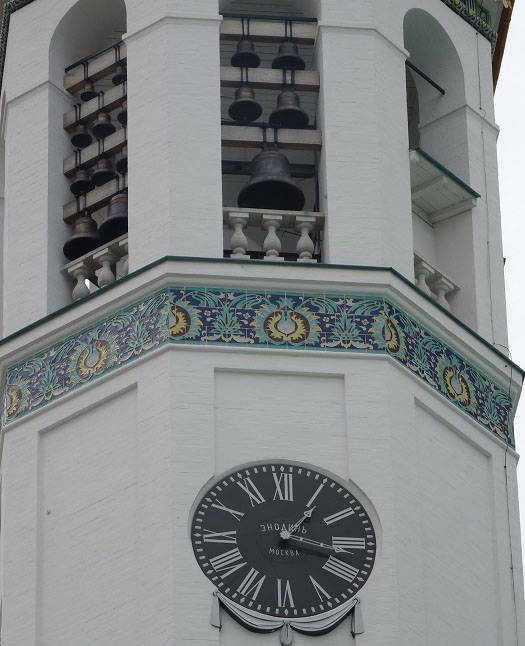 The heavy stone tented roof of the Resurrection Cathedral was replaced with a wooden one with many lucarnes which let plenty of light into the rotunda. 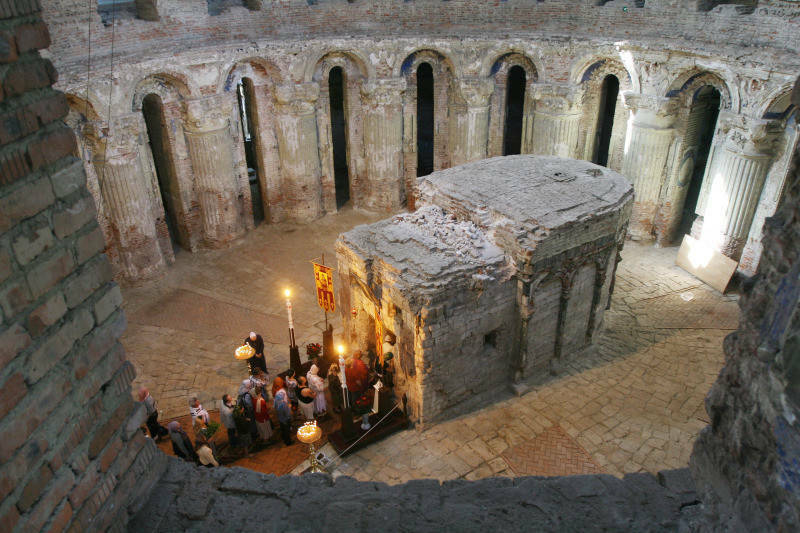 Adjacent to the eastern side of the Resurrection Cathedral is the underground Church of Sts Constantine and Helena, consecrated in honor of the Emperor of Constantinople and his mother. The church was constructed underground in order to mimic the Church of Sts Constantine and Helena in Palestine, which is carved into a rock. 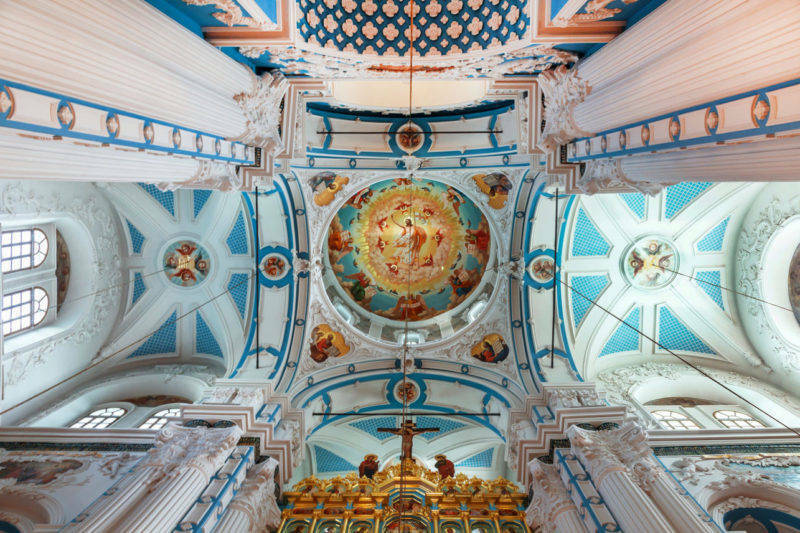 In the 18th century, the church was crowned with more domes and a moat was added as protection against groundwater. 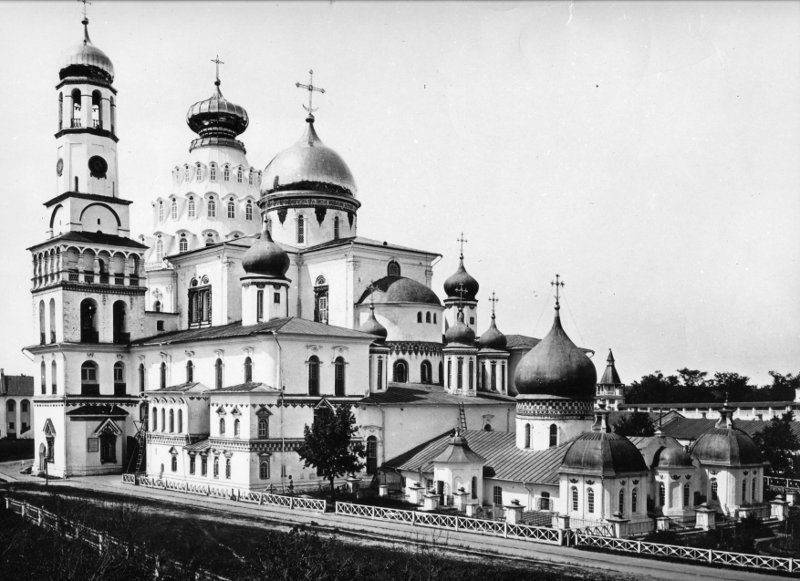 The tall, strong monastery walls were decorated with several towers, including the Gethsemane TowerRussian: Gefsimanskaya bashnya or Гефсиманская башня, the Zion TowerRussian: Sionskaya bashnya or Сионская башня, the David House TowerRussian: bashnya Davidov dom or башня Давидов дом, the Elizabethan Barbican TowerRussian: nadvratnaya Elizavetinskaya bashnya or надвратная Елизаветинская башня, the Inoplemennichya TowerRussian: Innoplemenichia bashnya or Инноплеменичья башня, the Varukh TowerRussian: Farukha bashnya or Фаруха башня , the Efrem TowerRussian: Efremova bashnya or Ефремова башня, and the Damascus TowerRussian: Damasskaya bashnya or Дамасская башня (listed clockwise). 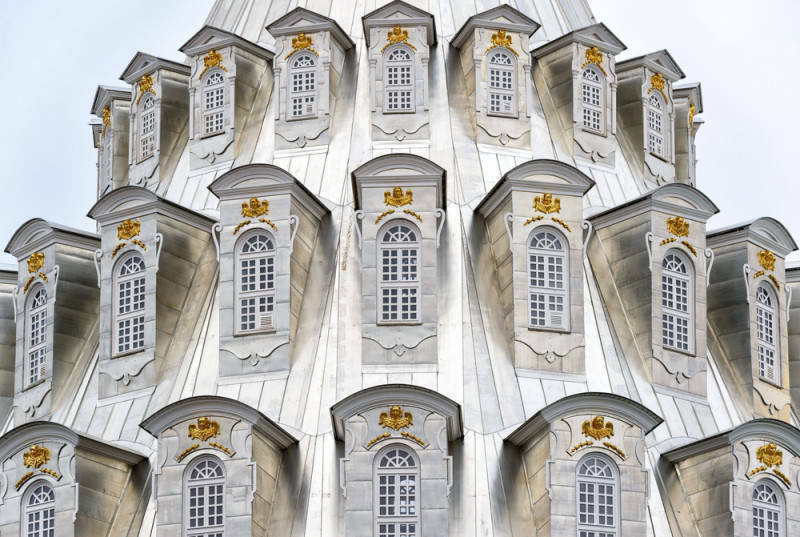 The towers are similar in appearance, yet they have certain differences in their decor, the width of their window openings, and even the shape of the individual parts. As with many other buildings in the monastery, the towers have undergone significant changes since Nikon’s time. The Elizabethan Barbican Tower has suffered the most. In addition to the towers, the walls are graced by the gateway Church of the Entry into JerusalemRussian: Vkhodoiyerusalimskaya nadvratnaya tserkov or Входоиерусалимская надвратная церковь, which was built under Yakov Bukhvostov’s supervision. Architecturally, the church is an octagonal superstructure on top of a quadrilateral structure surrounded by lower semicircles of the ante churches. 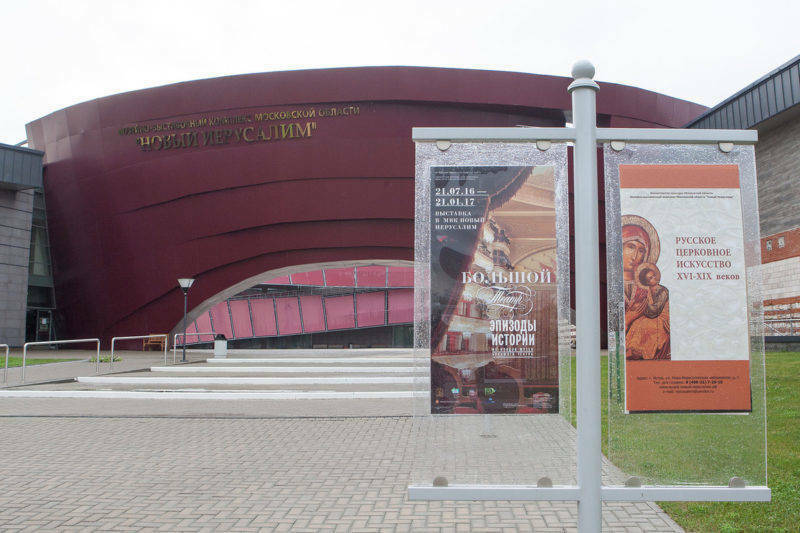 Despite its multi-tiered shape and the imposing impress of its height, the gateway church does not obstruct the view of the Resurrection Cathedral rotunda. 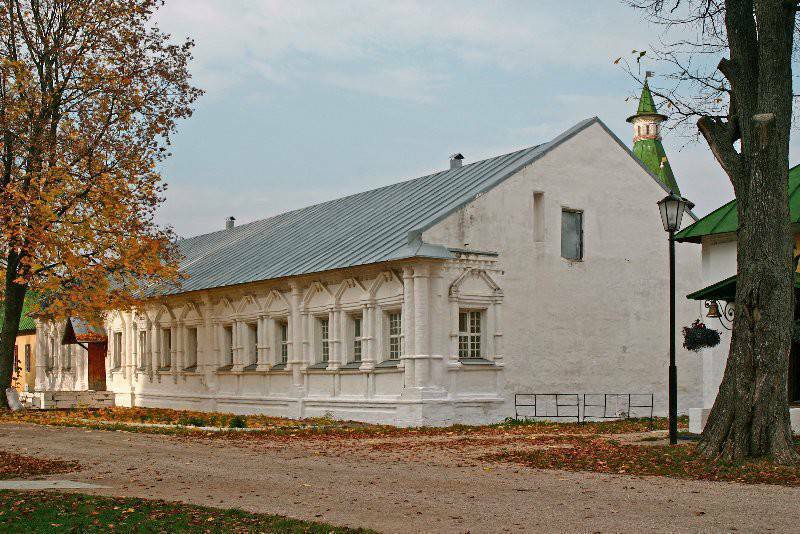 Utility premises are located in the western part of the monastery, most of which were built in the late 17th century on the orders of Tsarevnas Sophia and Tatyanathe sister of Tsar Alexey Mikhailovich. 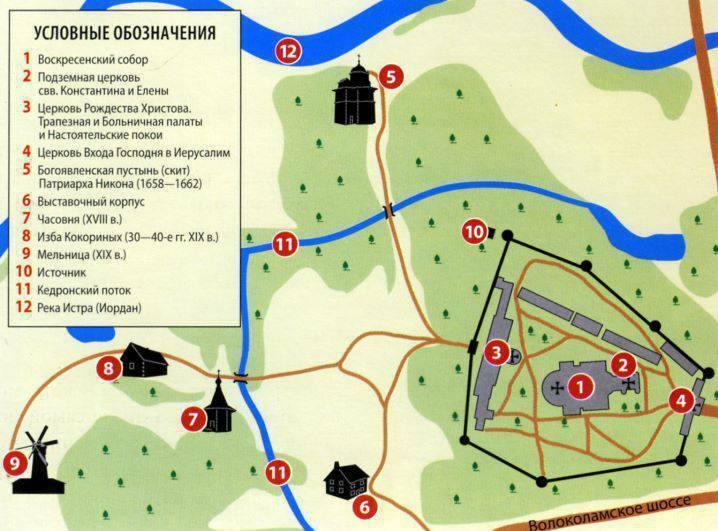 These include the refectory halls and the adjoining Church of the Nativity of ChristRussian: tserkov Rozhdestva or церковь Рождества, the hospital wards, the Archimandrite ChambersRussian: arkhimandrichi palaty or архимандричьи палаты, and the childrens’ chambers. Almost all the buildings have undergone major reconstruction and restoration, with the exception of Tatiana’s chambersRussian: palaty Tatiany Mikhaylovny or палаты Татьяны Михайловны, the malt house and the blacksmith’s. The former have a much more ornate look due to their canonical architraves and pilasters. 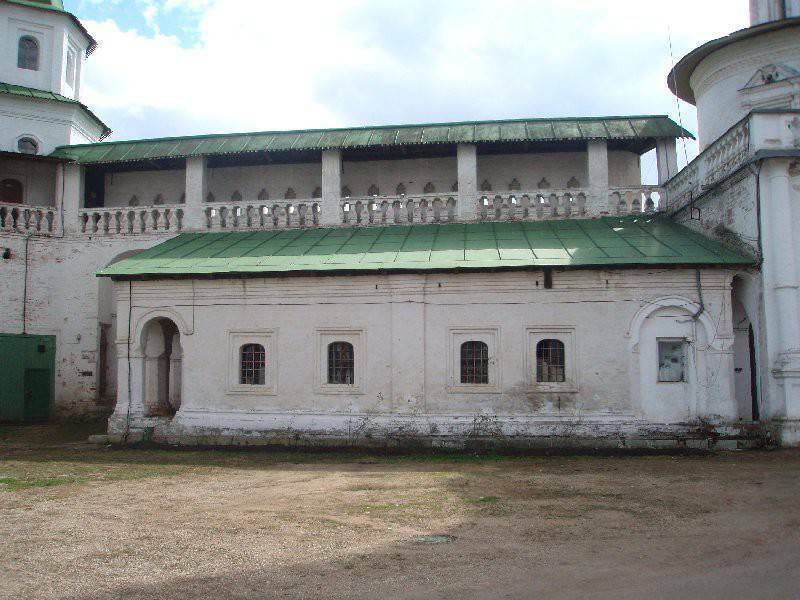 Another part of the monastery worth mentioning is the Skete of Patriarch NikonRussian: skit patriarkha Nikona or скит патриарха Никона, located beyond the Garden of GethsemaneRussian: Gefsimanskiy sad or Гефсиманский сад. 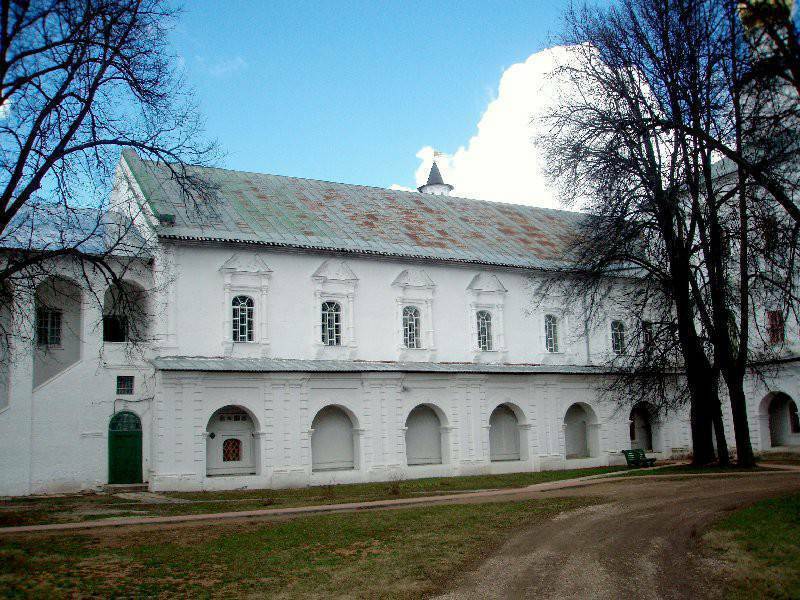 Mikhail Lermontov devoted a poem to it (‘The Abandoned Hermitage in Front of Me…’). 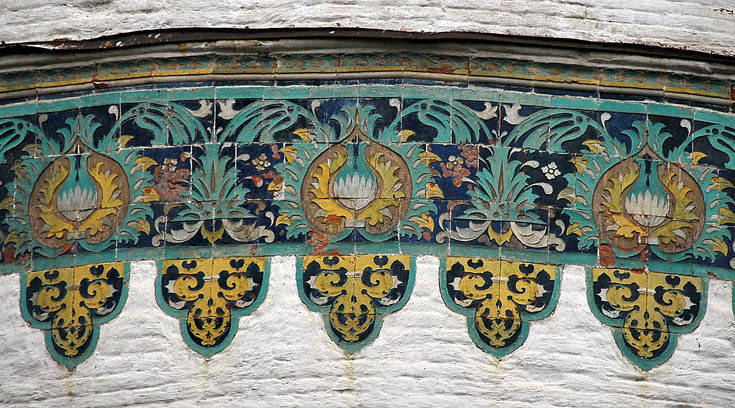 Despite the melancholy mood of the poem, the exterior of the building is ornate with its ceramic tiles and majolica decorations and does not resemble a skete. In contrast, its interior looks truly austere as is normally the case with any hermitage. 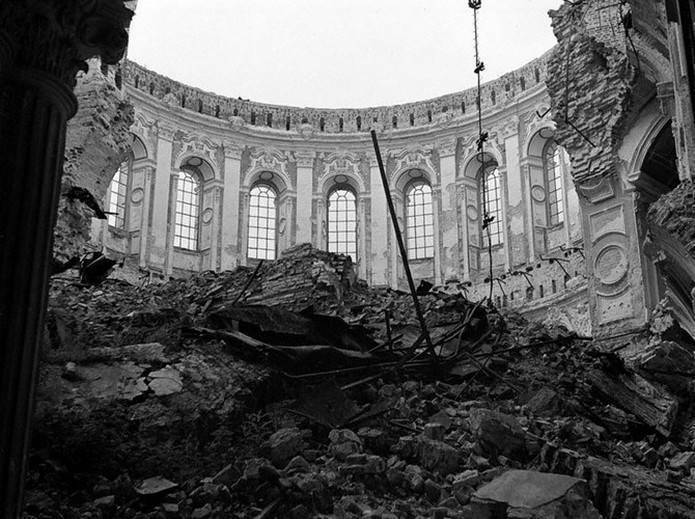 During World War II the monastery, which happened to be in a combat zone, was almost totally demolished. 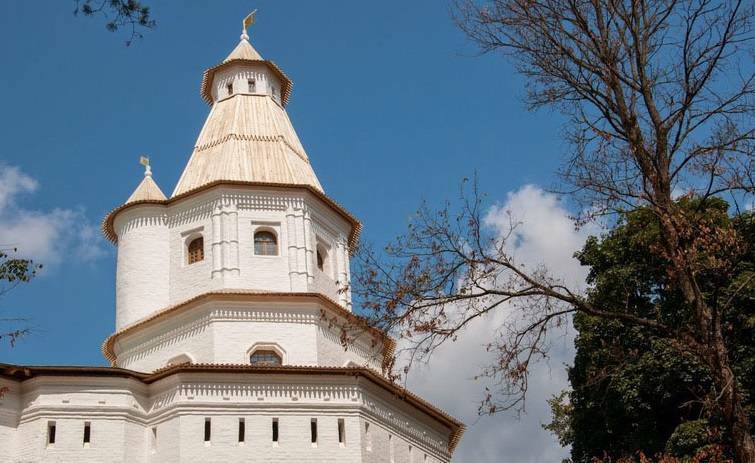 The first reconstruction began under the supervision of Petr Baranovsky, who wanted to restore the cathedral predominantly to how it was during the 17th century. The restoration work was consistently carried out during the period of the 1970s to 1990s, yet not all of the plans were realised. The main controversy throughout the restoration period was caused by the construction above the rotunda, or, to be precise, its height and material. On the monastery website there are photographs which give an idea of the state of this architectural monument after the explosion in 1941 and the subsequent restoration (http://www.n-jerusalem.ru/photo/text/30610.html). 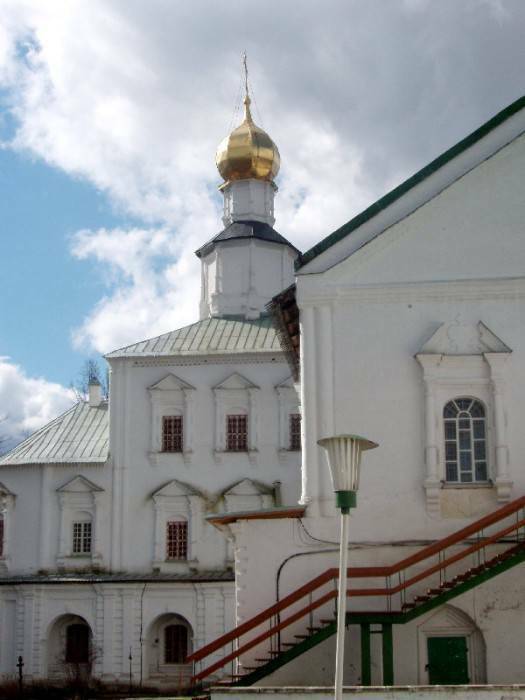 In 2008 another project to restore the monastery was begun – it is currently still ongoing. The question of the style in which to restore the monastery – the medieval (as in Nikon’s time) or the Baroque (as in Empress Elizabeth’s time) style – was a matter of much discussion. As a result, experts chose to restore the monastery according to Rastrelli’s design. 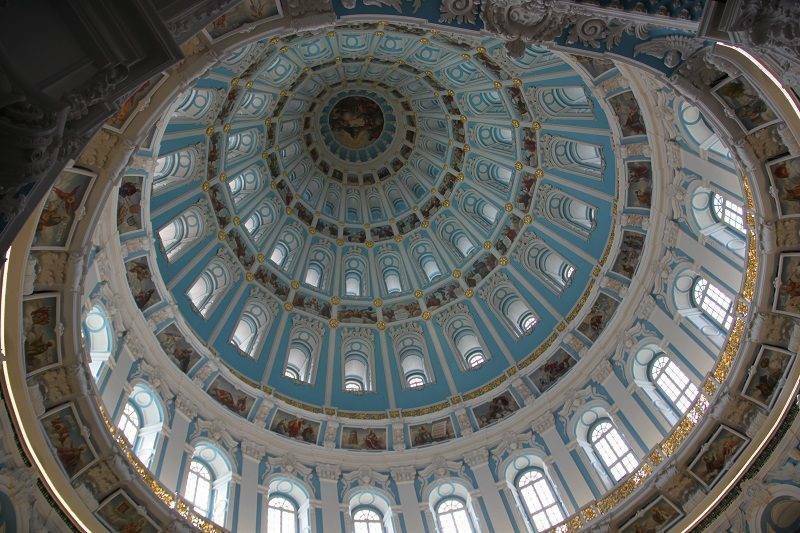 Firstly, there is more documented data and images available to guide the restoration process, and secondly, Rastrelli is a renowned Russian architect of the 18th century and his design is just as relevant as Nikon’s. 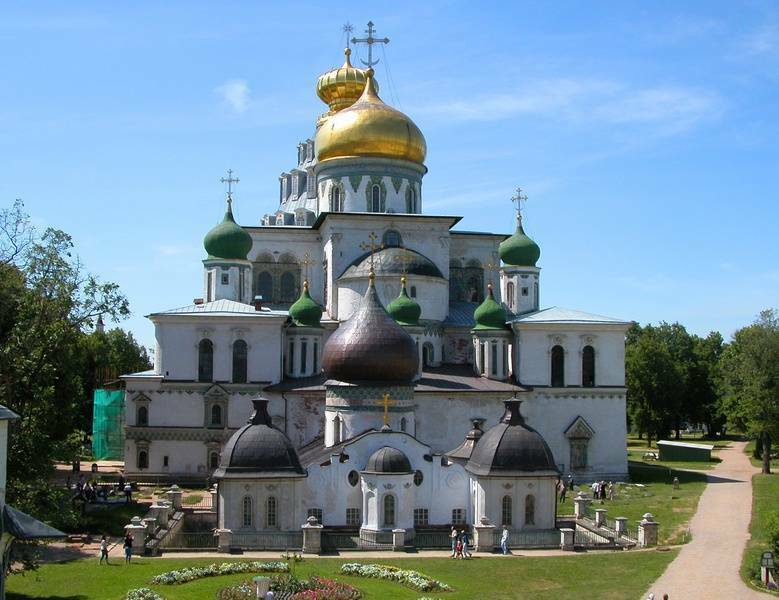 The main church of the New Jerusalem Monastery is the Resurrection Cathedral. 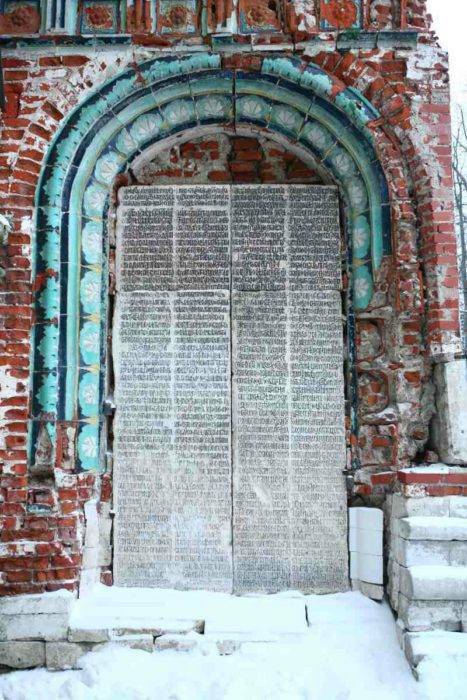 By the main entrance there are stone chronicles by archimandrite Nikanor written in the acrostic form. These chronicles are considered to be self-renewing i.e. they does not fade as the years go by but become even more visible. Legend has it that the same thing happens to the epitaph on the Nikon’s tombstone. You can visit the Aedicule, or the Chapel of the Holy Sepulchre in the rotunda of the Resurrection Cathedral. 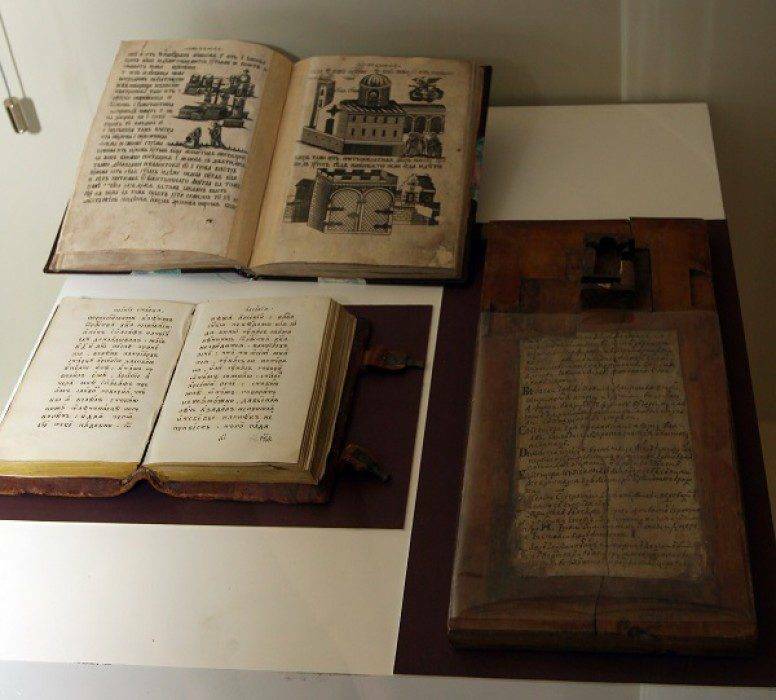 It preserves the Holy ShroudRussian: svyataya plaschanitsa or святая плащаница, which is laid upon the Anointing StoneRussian: Kamen miropomazaniya or Камень миропомазания on the Great Friday. The Saviour’s body anointed from the cross was placed on such a stone in Jerusalem. The Shroud itself is an analogue of the Holy Sephulchre in Jerusalem. 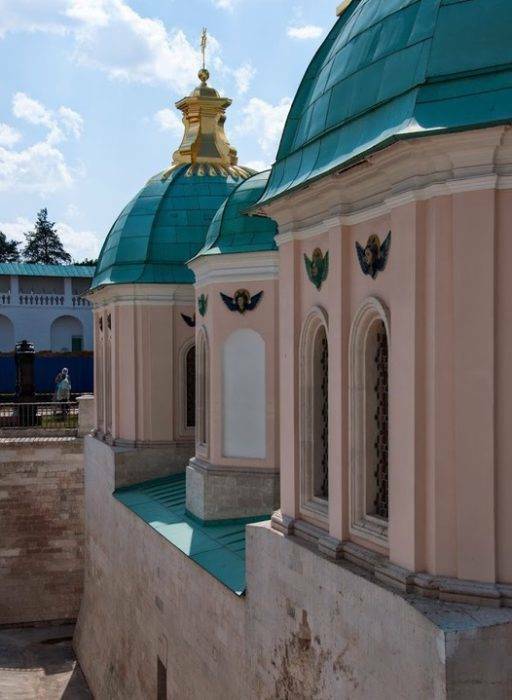 The side-chapel of the Beheading of St. John the Baptist houses Patriarch Nikon’s tomb (the Old Testament time tsar Melchisedec is buried in a similar place in Jerusalem). 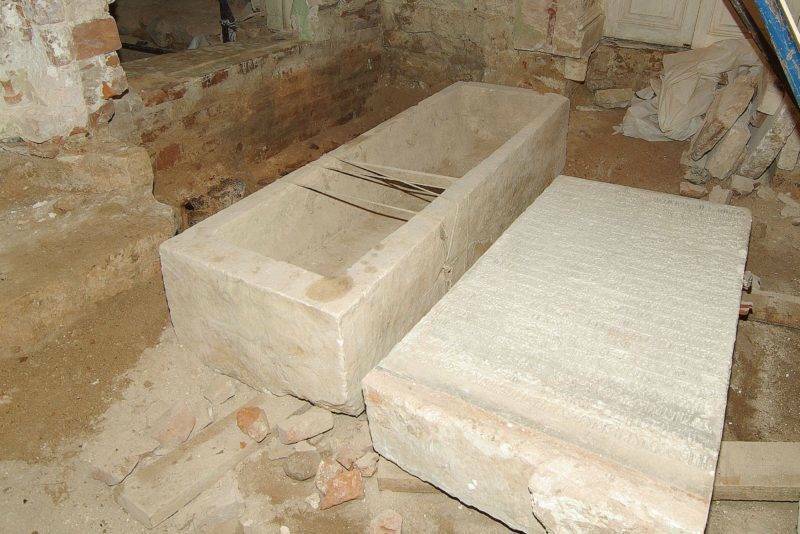 In 2013, the tomb was opened but, surprisingly, turned out to be empty. 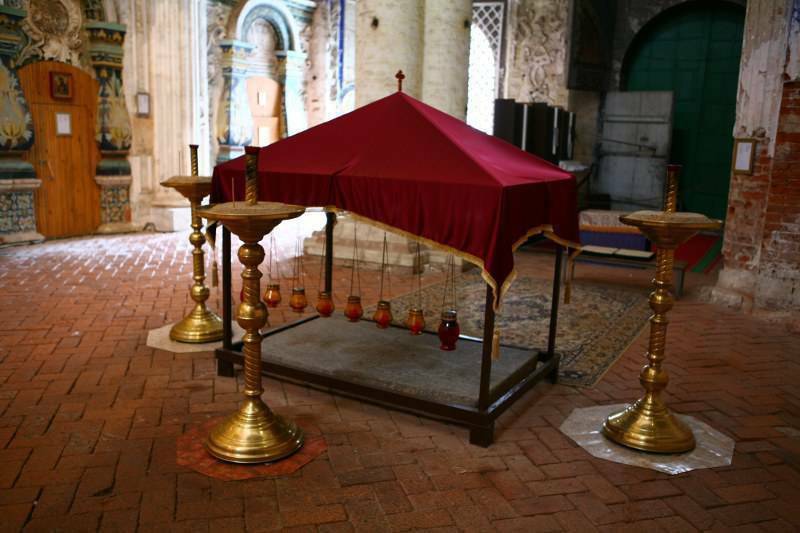 There is no evidence of where and when the Patriarch’s relics were transferred after the burial. 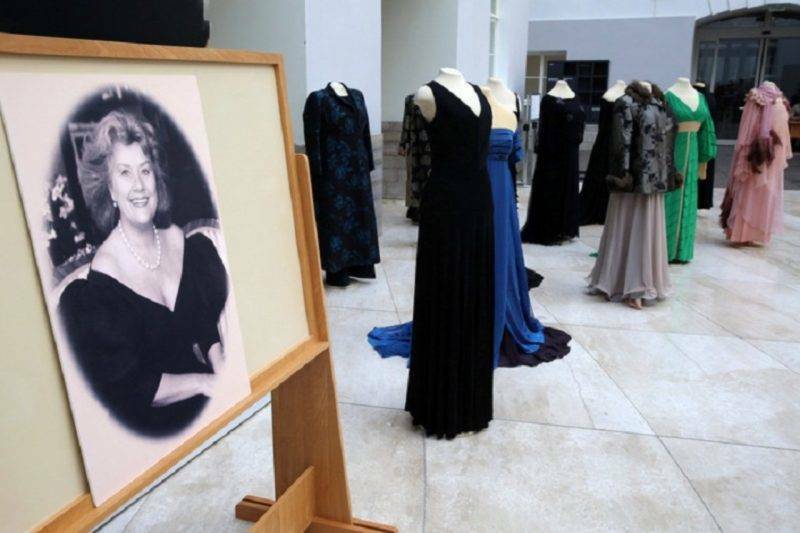 Nevertheless, services are regularly held near the coffin. 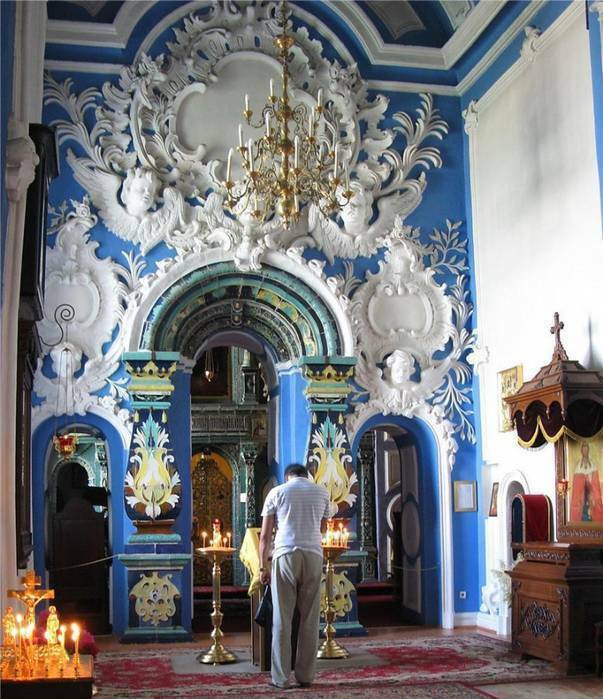 In this church, there is a ceramic tiled iconostasis from the 17th century as well as modern icons. 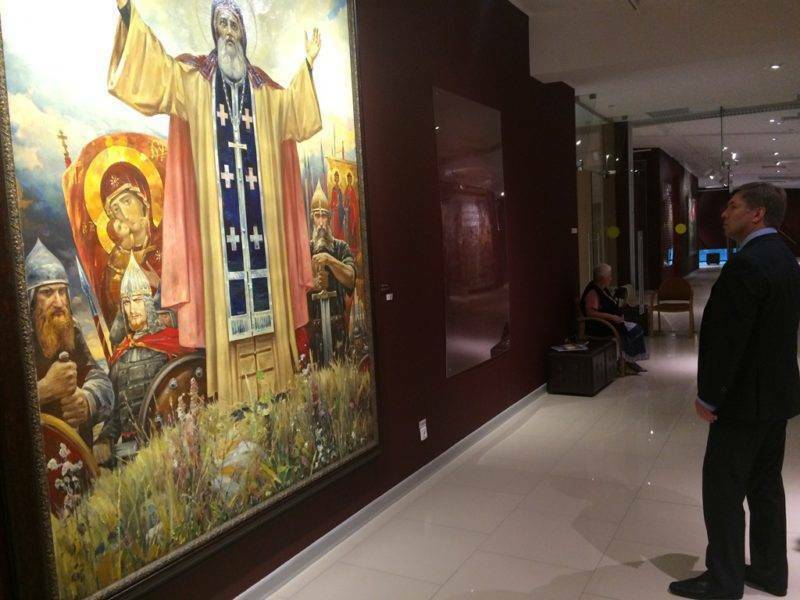 Some rare ceramic tiled iconostases can also be found in the Holy Passion side-chapelRussian: pridel Strastey Khristovykh or придел Страстей Христовых and the Archistratigus Michael side-chapelRussian: pridel arkhistratiga Mikhaila or придел архистратига Михаила. A copy of the Tikhvin Icon of the Mother of GodRussian: Tikhvinskaya ikona Bogomateri or Тихвинская икона Богоматери and Ioann Shusherin’s tomb, Nikon’s close associate and author of his biography, can be seen in the same side-chapel. 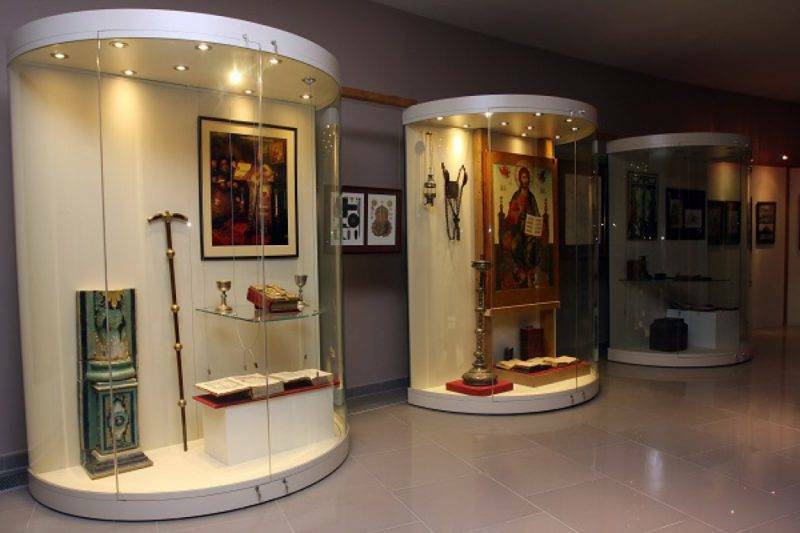 Some of the relics of the monastery closely related to Patriarch Nikon are a part of his pallium and antimensium. In the Calvary side-church, Nikon’s favourite place to hold services, there is an analogue of the Calvary where Christ was crucified. 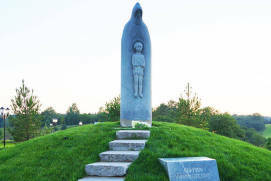 A wooden cross made of cypress was mounted here. 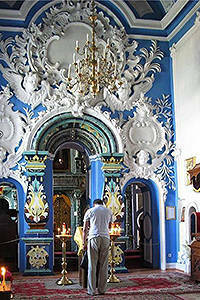 In addition, an 18th century iconostasis has also been preserved here. 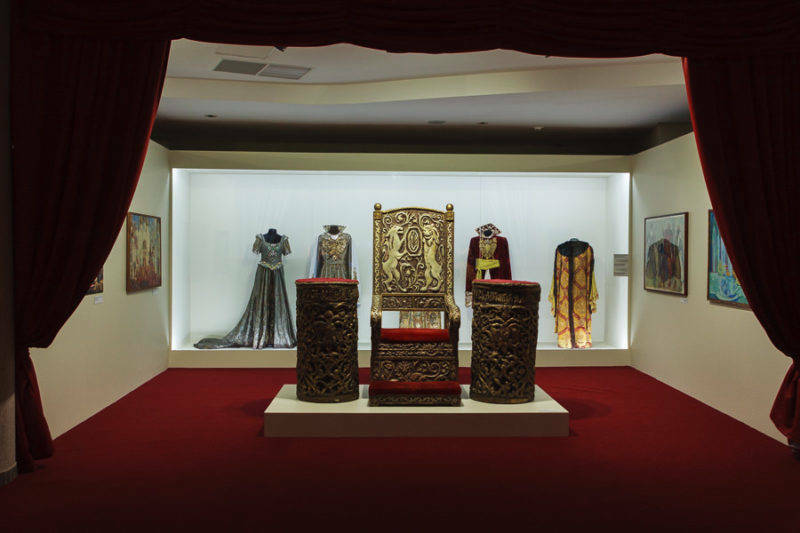 The Temnichnaya side-churchRussian: pridelnaya Temnichnaya tserkov or придельная Темничная церковь was consecrated in honour of the Dormition of the Mother of God. Prisoners used to be detained in Palestine in a rock cliff of Mount Calvary. It was there that the Mother of God mourned Her Son. This monastery church does not bear much resemblance to a dark cave; in fact, it is a small, yet well-lit place. The Dormition side altarRussian: Uspenskiy pridel or Успенский придел of the Resurrection Cathedral houses a small reliquary with St. Tatiana’s relics given to the monastery in the 17th century by Tsarina Tatiana. 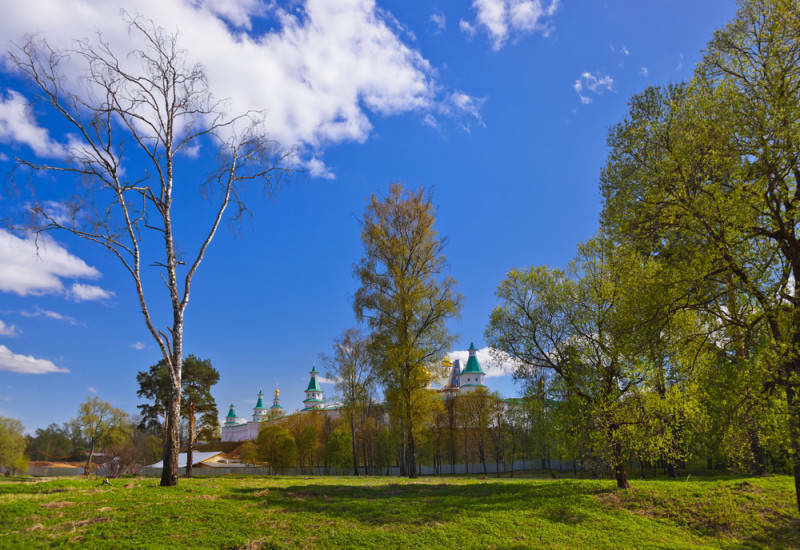 In the grounds of the monastery you can get some water from the “SiloamskyRussian: Силоамский” spring in the Gethsemane Garden or from the “Life-Giving SpringRussian: Zhivonosnyi istochnik or Живоносный источник” well in the underground Sts. Constantine and Helena Church. 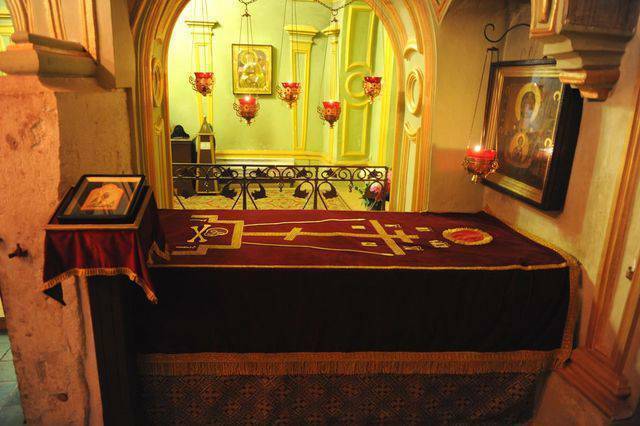 In the Holy Land, there is a place where, at the same spot and the same depth, Constantinopolitan Empress Helena gained the Holy Cross. A citizen of Jerusalem indicated the approximate location of the cross to Elena. Later, he was baptized with the name of Cyriacus but subsequently was murdered by antiсhristians. Today, he is venerated as a martyr and a saint. There is a side altar in the church commemorating these events. Visitors can take a dip in the river Jordan (Istra). There are no comfortable changing rooms or convenient ramps to approach the water yet, but this does not prevent hundreds of believers from bathing in the ice holes on the holiday of the Epiphany. 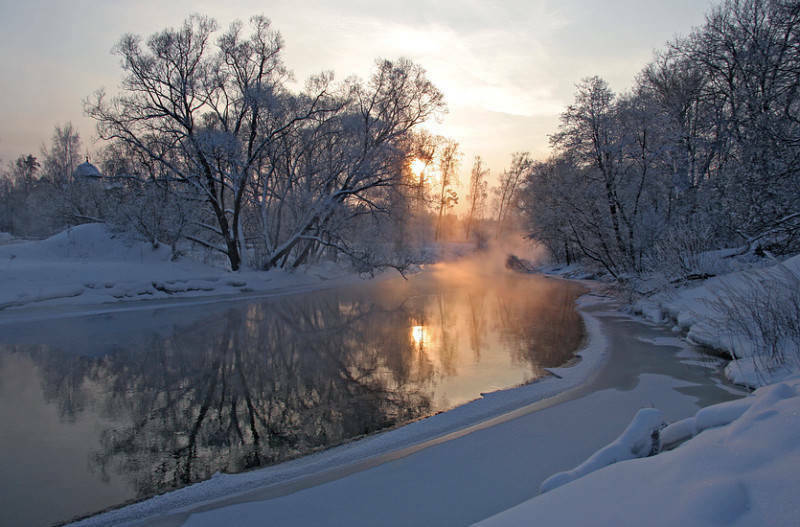 Legend has it that on Epiphany night on the 18th-19th January, you can witness a miracle happening on the Istra river: at 1.30 p.m. the water stops and the river hardly flows for five minutes. Near the river on the Mount of Olives, there is a Memorial Cross. It is a copy which was made in 2006. The original cross was set up in the 17th century to honour the first consecration of the monastery. 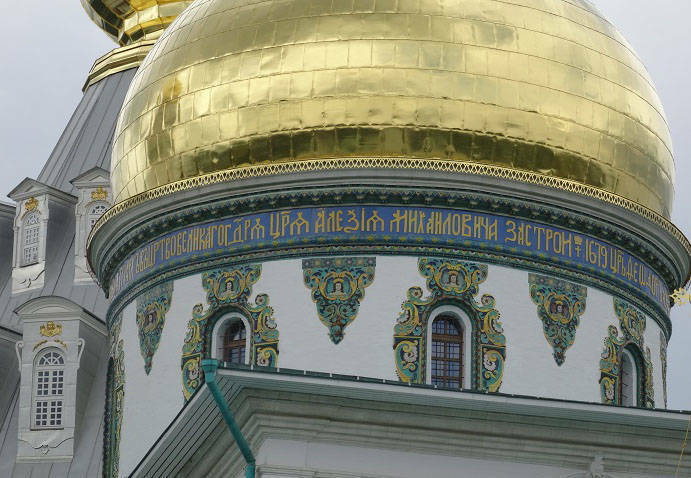 The inscription says that Tsar Alexey Mikhailovich “found the neighbourhood to be as beautiful as Heavenly Jerusalem, thus the name he gave to it and the monastery to be constructed was named New Jerusalem”. In this way, the history of the monastery began. The topographical features of the Russian Palestine – a reproduction of the religious sites to some extent created by nature itself – is probably the main feature of the monastery. The landscape of the locality before the construction of the monastery amazed Nikon because it reminded him of Palestinian religious sites. 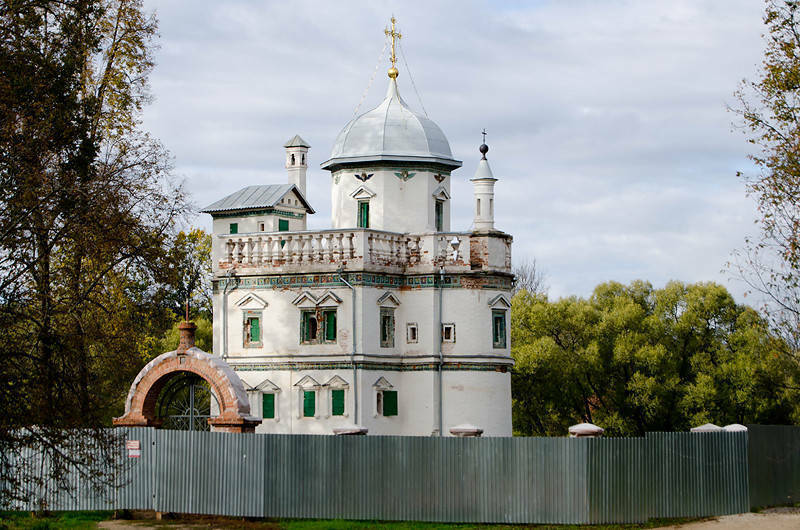 The former Resurrection Church in the centre of boyara member of the highest rank of the feudal society in Russia Boborykin’s estate became the focal point of the whole project – an analogue of the Holy Sepulchre in Jerusalem. To the north, the Church of TransfigurationRussian: tserkov Preobrazheniya Gospodnya or церковь Преображения Господня stood in the village called BuzharovoRussian: Бужарово and to the east the Ascension ChurchRussian: tserkov Vozneseniya or церковь Вознесения was located in the village of AleksinoRussian: Алексино. 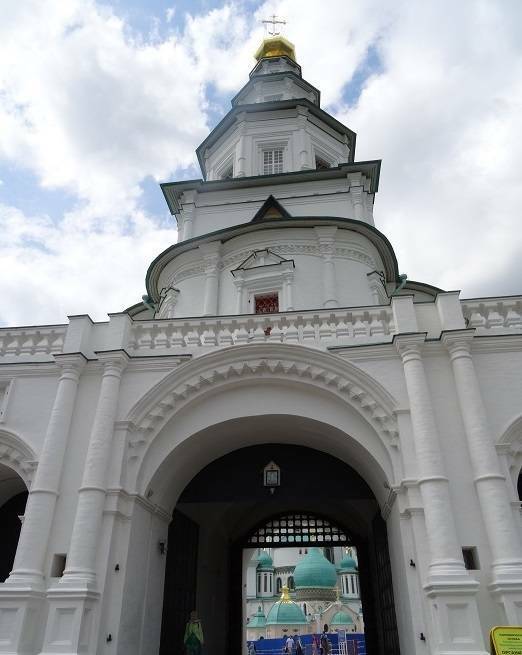 To the south and south–east of the Resurrection Cathedral, the Church of Prophet ElijahRussian: tserkov Ilii Proroka or церковь Илии Пророка and the Church of the Nativity were located. In Palestine’s toponymy, this place is occupied by Bethlehem, where the Saviour was born, with St. Elijah’s Monastery built in the 4th century close by. 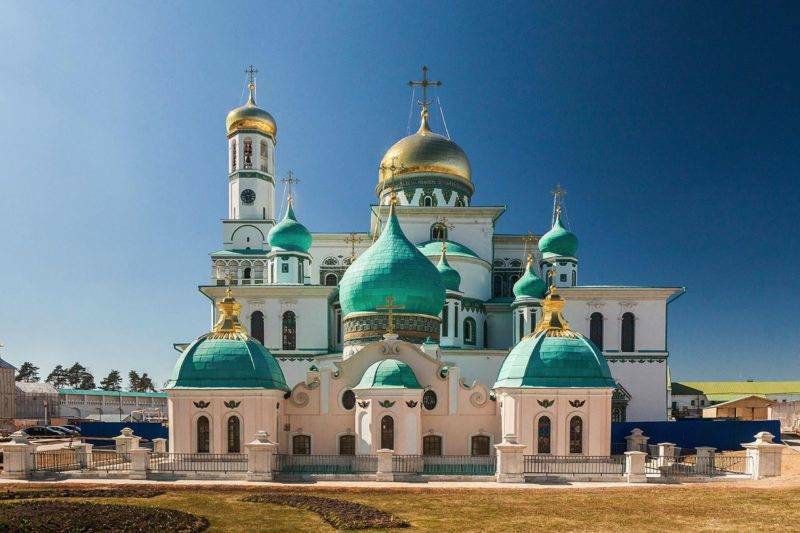 The Russian counterpart of the place called Ramah located not far from Jerusalem, where prophet Samuel was born, is the Church of the Nativity of the Blessed VirginRussian: tserkov Rozhdestva Bogoroditsy or церковь Рождества Богородицы with prophet Samuel’s side-altarRussian: pridel proroka Samuila or придел пророка Самуила. In Palestine is the Sabbas the Sanctified Monastery, while near the Russian Palestine, the Savvino-Storozhevsky MonasteryRussian: Savvino-Storozhevskiy monastyr or Саввино-Сторожевский монастырь can be found. 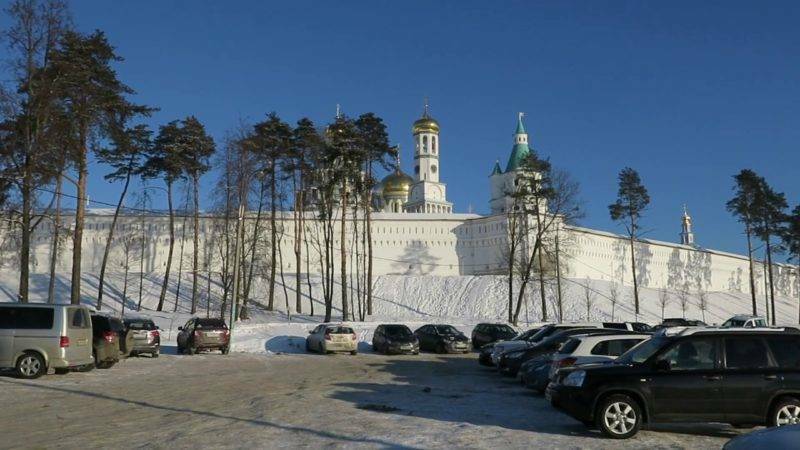 Photo and video filming on the territory of the monastery is free. 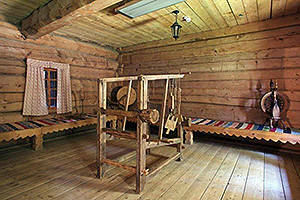 It is possible to order a guided tour on a paying basis.